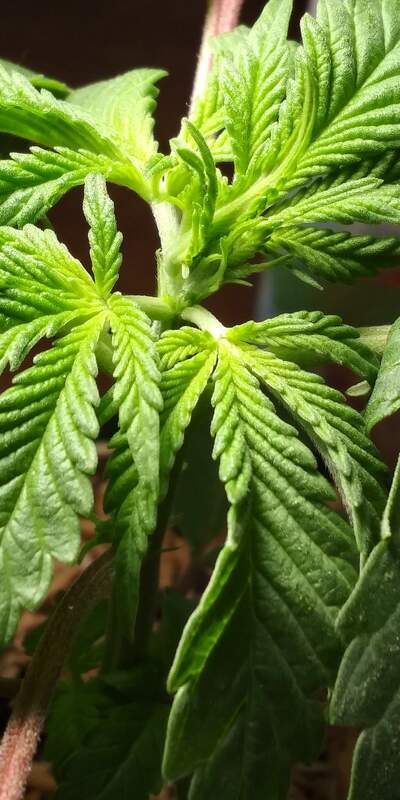 I like to leave as much of the bottom of the plant as possible when revegging, but I've done it with success just leaving little more than a few buds when I didn't have a choice (chopped before deciding to reveg, etc). 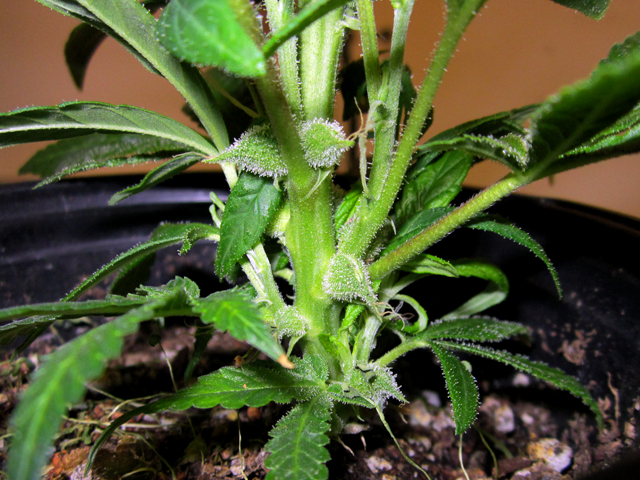 This plant had little more than a few buds and minimal leaves left after the chop when I decided to reveg it (photo taken after it had started really bouncing back). Sad little thing, lol. But it worked. 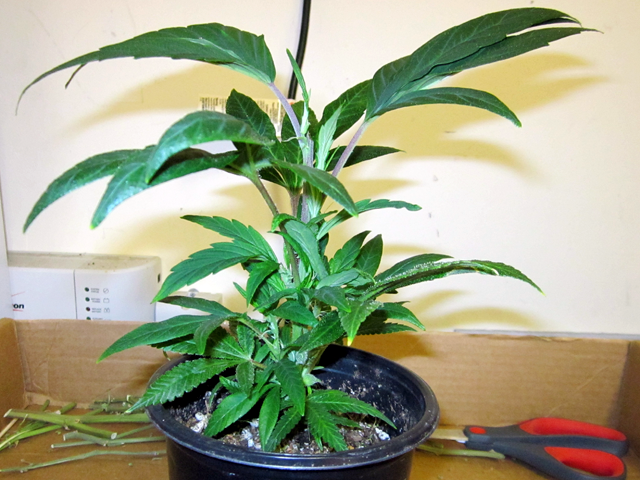 I've even just taken a tiny branch and stuck it in the cloner, and revegged it once it rooted. I see lots of shots of early flowering , in flower, What I need atm is a couple of shots of a plant ready to pick that has seeds. Never been there and I am waiting impatiently for some to mature. I plucked a bean from a bud a bout 10 days back but it was green. Should I pull a small bud and break it down to check? If I chop and hang a week ...will they be mature enough? BAM! Thank you brother. Of course this tidbit of expertise is going right where it belongs! 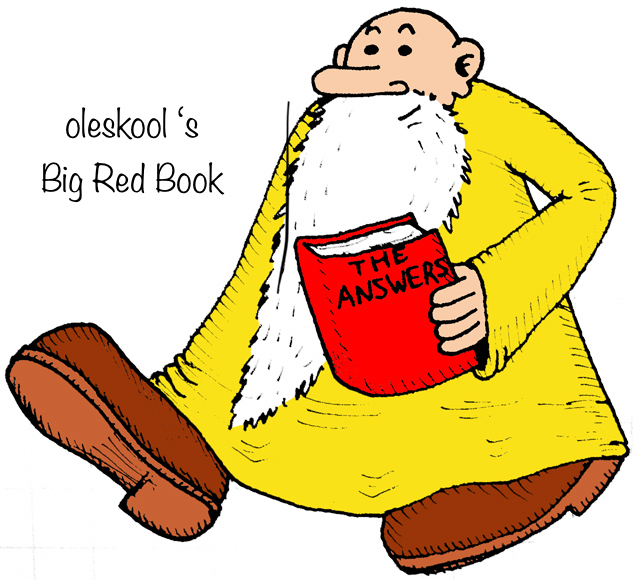 Oleskool’s Big Red Book of Aquired Knowledge. It can sometimes take extra time for the seeds to mature. I never chop before the seeds look pretty brown and you can see the marbled pattern. You can chop a popcorn bud and look at the seeds. I find the ones at the bottom of the bud are usually the most mature, and the ones on the outside are often the least mature. Kind of my thought. I figured I had to at least see one that looked viable to crop. It's taking its sweet arse time ...likely due to me sticking it out in a cold (40-50 F) , dark stairwell at night for about a week. I'm sure it slowed things down. Had to because of mites they had built a tent on the main bud. So it got me thinking about all the variability in the strains vs the regions/zones and night time temps. I was thinking cold temps at night while the seeds formed might cause the plants to respond with earlier/shorter flowering times? @Howard.Crane. You put it precisely where it was needed my friend. Much gratitude to @lefthandseeds and @Howard.Crane. No worries! So we are talking Afghans? I had 3 freebie Afghan seeds. Long story short one is just a bit odd for an Afghan. Smaller leaves, Prays a lot. Noticed it had some extra fingers growing in the middle on a few lower leaves. Anyway today I saw three fans leaves at a node. well it's 4 leaves and the nodes are just so tight I cannot see any difference yet apparently. they will stretch between them I'm sure. Be glad when these runts start alternating nodes. Need to 12/12 them but no room atm. Black lebs are turning black. Even one of the BH lebs looks like it'll turn as well. The Blue Hemp lebs have really crazy flowers. They look like they'll be a lot less dense than the black lebs, and less frosty -- more sativa-like in all regards. The Cherry Queen Afghani females are looking great. And the first image of the male is a Black Afghani that is really stacking fat. I think it'll make some nice hybrids. Stellar work my man @lefthandseeds. That Lebanese is fascinating. How long to finish those? Thanks! There's not a ton of information out there on the Blue Hemp Lebanese, but I did find them on seedfinder. It says 40-45 days, which is incredible! They definitely are developing fast. I'm skeptical that I'll harvest after 45 days of flower, but we'll see. According to my posts, these plants are 36 days into flower. If these are done in 9 more days, I'll be amazed... I might have to chop all but the seeded portions of the plant, because I don't think the seeds are anywhere close to finishing. The Black Lebanon says 60 days, pretty normal. I think I remember that you've grown that one before, right? I really like it so far, and one of the two is really nice and frosty. 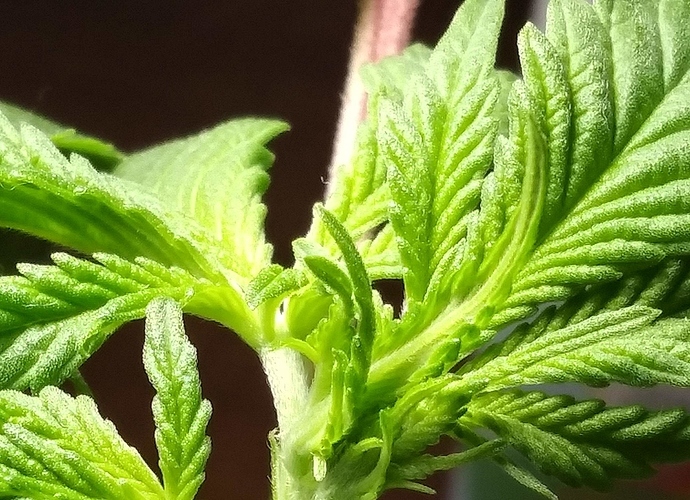 Those Black Lebs only come in feminized seeds, so I saw it as a pretty good opportunity to cross it with my Blue Hemp male. I have a few more Black Leb seeds to work with, so I might cross them back again to the Black Leb at some point in the future... or if I like them both, just line breed the Blue x Black hybrids. I need to get stoned first to find out! very cool. The blue hemp lebanese are very similar in structure and appearance to the real seed co lebanese, more so than I would have expected. The only difference seems to be that the blue hemp has waxy leaves, and the rsc had lighter colored matte leaves. 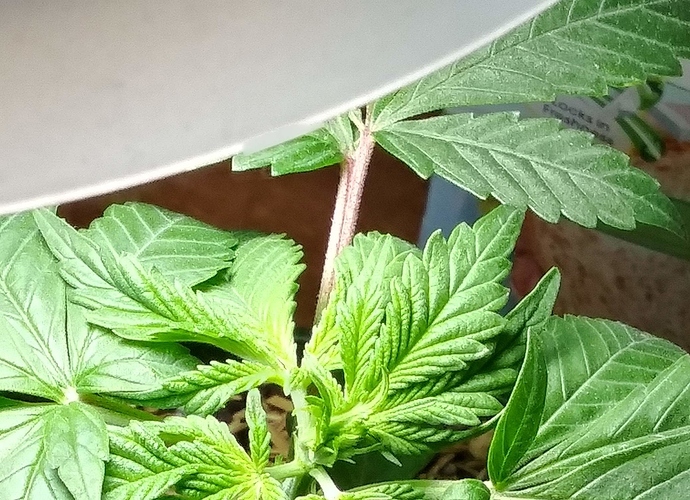 have you found any phenos with pink/purple pistils? that seemed somewhat common in the rsc lebanese. The lebanese black looks like it has a completely different structure and different resin glands/ resin production. what is the background of those genetics, is it known where they originated in Lebanon? If I remember correctly, the Blue Hemp is bekaa valley genetics. The RSC lebanese is from a higher elevation farm in the foothills of the mountain ranges that surround bekaa valley. Interesting to hear your comparison with RSC. I have some of those as well but haven't grown them yet. I have seen some pink pistils. I'll post a few pictures tonight. One of the two black lebs also has waxy leaves. I'd say that the blue hemp has more sativa traits with the smaller trichomes and more airy buds, while the black lebs has more indica like features. I'm not sure if the black lebs originated in the bekaa valley. My guess is that they were bred off of Ace's Lebanese, but that's just a guess. I'll do a little research and see if I can find anything. Another thing that the blue and black might have in common is black leaves. I'm starting to see the margins fill in with color on one of the blues. It might only exist in some phenotypes though. Thanks man! I love it. Fascinating strain. Respect! Got out the macro for a few shots. 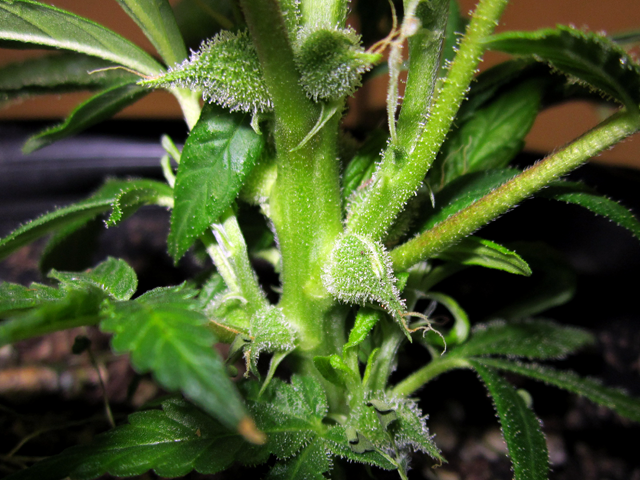 The BH Lebanon maybe doesn't have pink/purple pistils, but rather some purpling on the calyxes. You can see the major differences between the two colas of the Black Lebanons. @PoppaPuff Here are my little plants. Looking much happier a day after transplanting. The Lowland crosses are slightly taller in stature than the Black Domina crosses. But no surprise there, as the Lowland was also a bigger mother plant. I have 5x BlackDak and 3x LowDak. Yesterday was day 1 of flower for these. I have a bunch of pollen in my dry box that will hopefully keep for 2-3 more weeks while these develop. I'm thinking of making a double cross with the Black Afghani and Cherry Queen to the BlackDak. 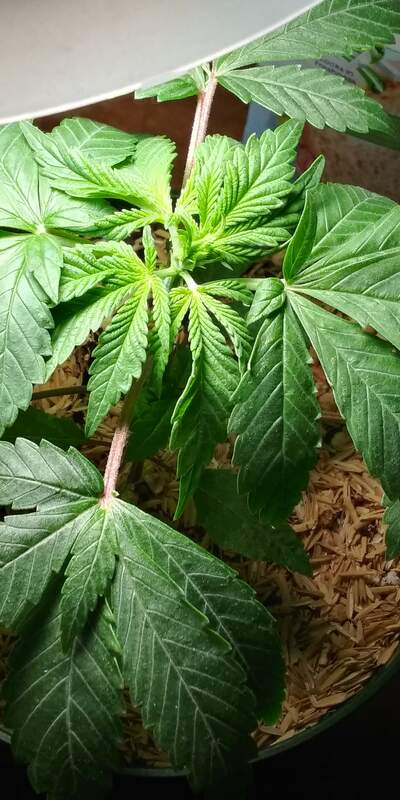 First pollinating all of the plants on a few branches, and then selecting the best mother and crossing plants from the Black Afghani and Cherry Queen. It's going to be quite the Afghani romp. The lowland is a strong plant. Its easier to grow and is less picky than my other strains. Everyday the lowland ladies are smiling away. Praying everyday still. That was my experience from growing the mom out. Really, both the dakini and lowland afghani were easy to grow. I feel like the dakini has been fairly recessive in the traits of both of these, thus far. They seem to reflect more from the black domina or lowland side. I hope to see more of the dakini expressed in the bud structure. Looking forward to seeing the flowers.